The elves at Big Balloon have been writing their list and checking it twice, to come up with a collection of toys that will put smiles on the faces of girls and boys this coming Christmas – and its full of retro fun! From collectibles to action figures and traditional baby dolls with a hi-tech twist, from stocking stuffers to the hottest, most exciting presents under the tree, there's lots of fun stuff to choose from. The original Stretch Armstrong action figure from the 70s is back to delight a new generation of kids. More than 40 years on, Stretch hasn't aged a bit – featuring the original head sculpt, you can still stretch him and tie him in knots, before he slides back into his original musclebound shape. And he's been joined by some new and old friends…. The ultimate crime fighter has been Stretched! Have super stretchy fun with the Justice League Batman Stretch action figure as you pull him into impossible positions… before he slinks back to his cool as a bat shape. 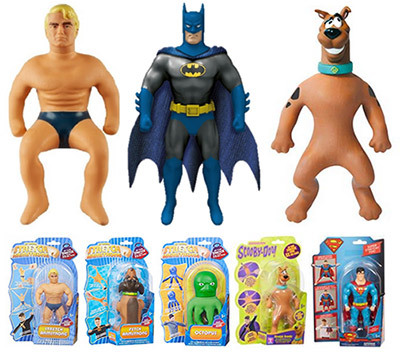 These fully stretchable 7" figures look just like the original Stretch Armstrong toy collection, and they can stretch up to 5x their size. Grab hold and stretch their legs, release and they retract back to their normal size and shape. Super strong! Super stretchy! More of your favourite super heroes have had a mini Stretch makeover too! Stretch them, pull them, tie them in knots. When you release your figure, he uses his amazing strength to slowly return to his normal shape. Who doesn't love Scooby Doo, this 32.5cm size Stretch Scooby Figure can stretch up to 3 times his size. Stretch him, pull him, tie him into knots! Stretch Range are for Ages 5+ available now through Big W, ToyRus, Mr Toys Toyworld, Myer World Central.